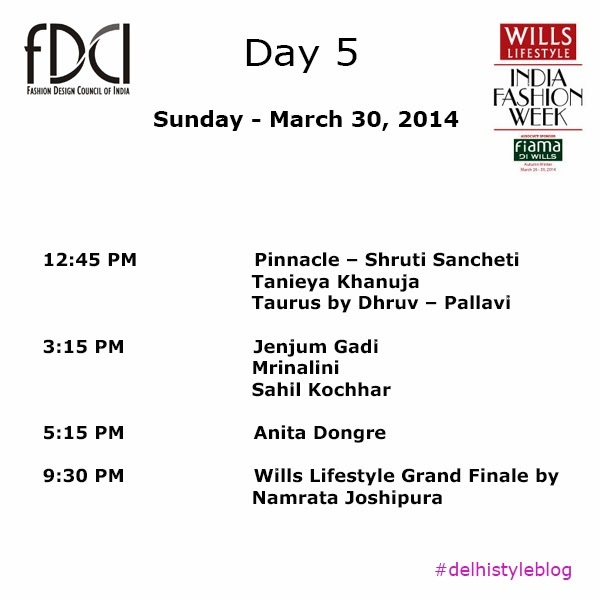 The Fashion Design Council of India has released the schedule for the Wills Lifestyle India Fashion Week Autumn Winter 2014 dear readers. The five-day fashion event takes off from March 26-30, 2014 at Hall no. 18, Pragati Maidan, New Delhi. 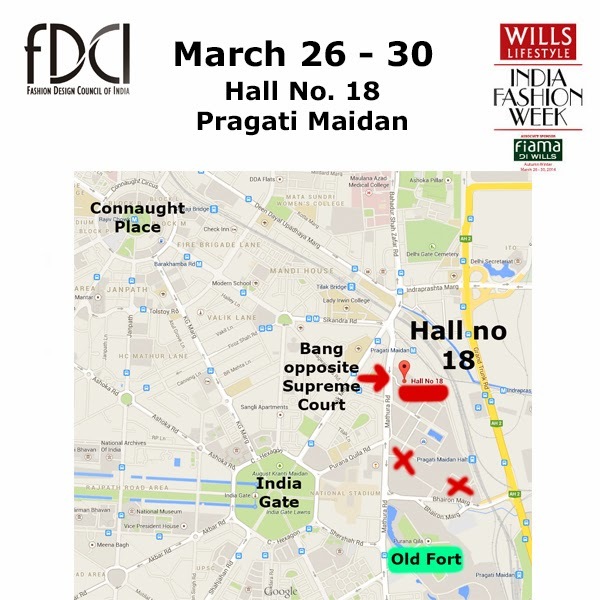 This season of WIFW A/W’14 will witness the participation of 119 designers from a mix of leading, as well as upcoming designers from all over the country. As an Indian Fashion Blogger, we are so excited. 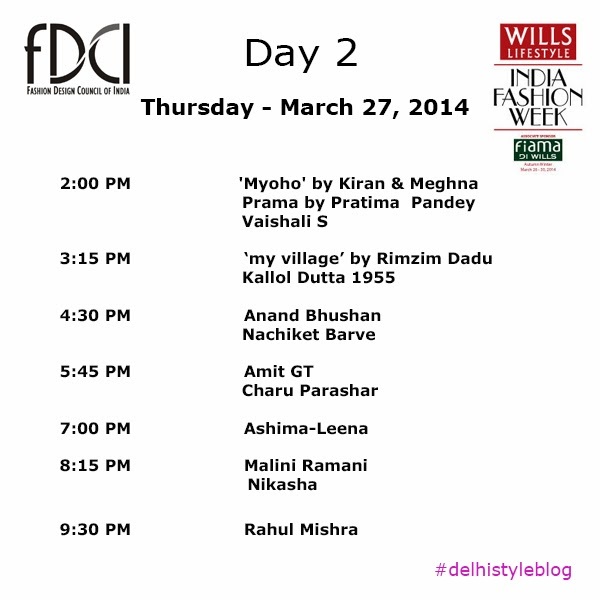 Here is the the schedule infographic that you can download to your mobile for easy portability, and the official press release from FDCI. "The 23rd edition of the Wills Lifestyle India Fashion Week Autumn-Winter 2014 promises a prodigious opening with ace style guru Tarun Tahiliani spearheading the hotly anticipated fashion extravaganza. 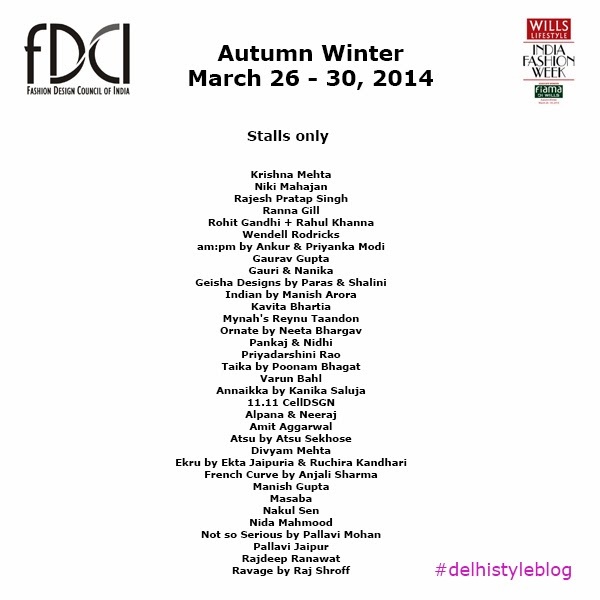 The five-day fashion event will be held from March 26- 30, 2014 at Pragati Maidan, New Delhi. Tarun Tahiliani expressed his happiness by saying, “It is always wonderful to open a week with all the resultant expectation. 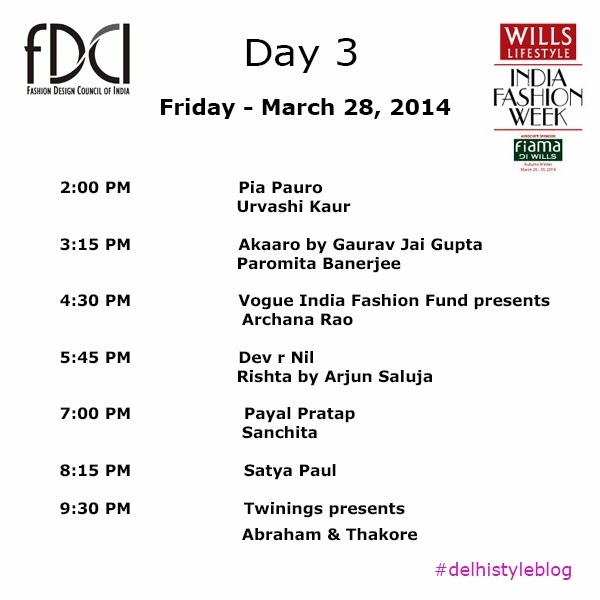 Wills India Fashion Week held under the auspices of the FDCI is the premier trade platform for the ready-to-wear in India. It is here we will debut the new Autumn Winter Collection, a celebration of colour, drape, jewels and a true synthesis of modernity overlaying tradition. To reflect what Amrita Sher-Gil said –“I am an individualist, evolving a new technique, which, though not necessarily Indian in the traditional sense of the word, will yet be fundamentally Indian in spirit”. 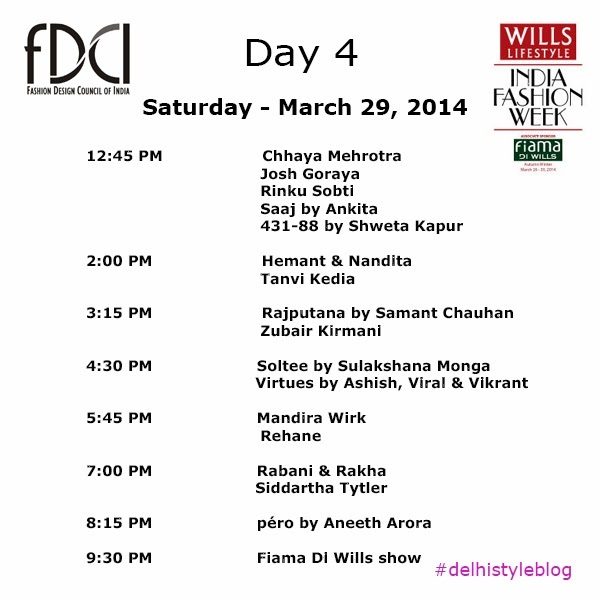 The FDCI has announced the show schedule for the upcoming Wills Lifestyle India Fashion Week, A/W 2014 along with a robust line-up of participating designers. This season of WIFW A/W’14 will witness the participation of 119 designers from a mix of leading, as well as upcoming designers from all over the country. The most anticipated event of the year kicks off in March with designers showcasing heady collections to domestic as well as international buyers, the media, and fashion connoisseurs. Fashion Design Council of India: A non-profit organization, the FDCI is the apex fashion council of India. 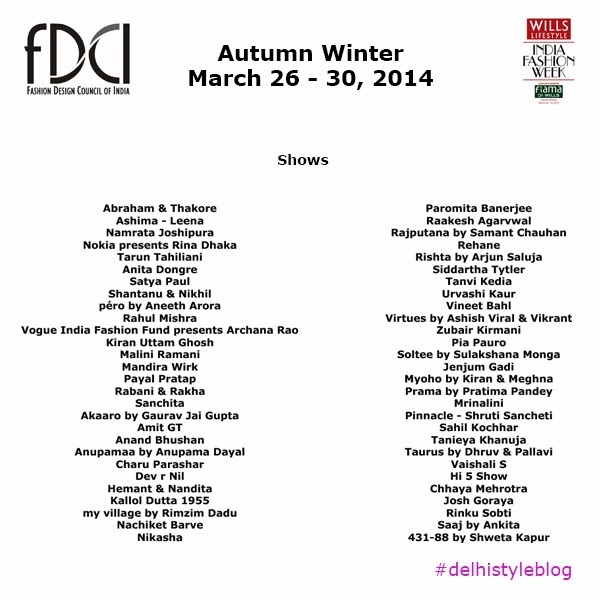 Represented by over 300 designers, the FDCI takes Indian fashion global by promoting the 'business of fashion'.